Luckily, I found justification in buying up one of her other films — one that I genuinely love. At $9.99 on Amazon and featuring a DVD copy of the older film, The Shop Around the Corner, which also borrows its story from the same Miklós László’s stage play, You’ve Got Mail was a steal, and its purchase a cathartic experience for me. You see, as a guy, it was hard to admit it for a while but, yes, I genuinely have the whole guilty pleasure thing going on with this movie. Yes, it’s a romantic comedy. Yes, it’s a romantic comedy with quirky characters. Yes, it’s a romantic comedy with quirky characters, familiar pop music from past and present, and, yes, it has fluffy little moments of sentiment and contrivance. And, finally, yes, there’s that whole product placement issue, too, with the film taking its title from a now dated internet service provider’s email system, the same ISP that sent us all those annoying, useless, and wasteful CDs in the mail all the time for its awful internet services before people finally came to their senses. 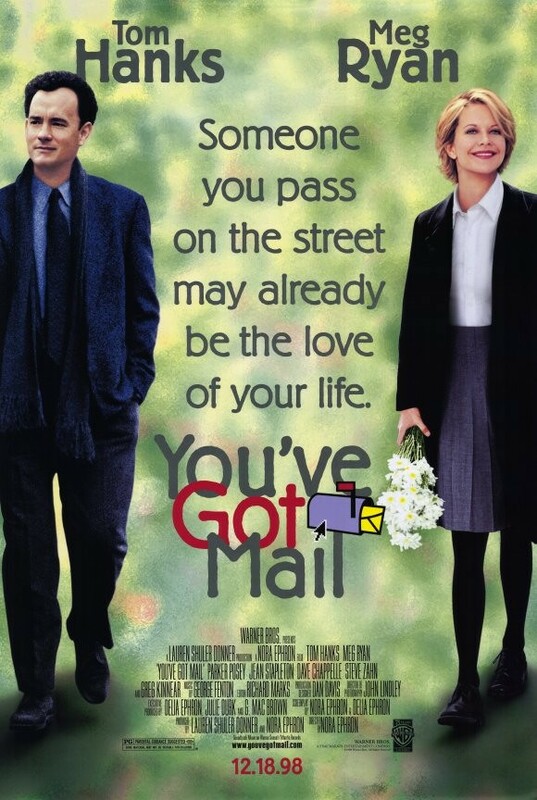 By all means, You’ve Got Mail should’ve been a terrible film, but somehow, Nora Ephron managed to catch the Tom Hanks/Meg Ryan magic in a jar once again and, in my humble opinion, managed to improve upon it. The story focuses on Kathleen Kelly, inheritor and owner of her mother’s tiny children’s bookstore, The Shop Around the Corner, and Joe Fox, the third in a line of book misers at the giant bookstore chain Fox Books (think Barnes & Noble, complete with cafe and special interest sections). In person, the two become bitter rivals as Fox Books is about to open up yet another new location, just around the corner from Kathleen’s little store, which has held its own against the world of big business since her mother opened it several years ago, when Kathleen was just a little girl. What the two of them don’t know, however, is that while each of them can’t stand each other when face-to-face, they are unwittingly falling for each other over the internet, having met online in an AOL chatroom and agreeing to correspond with each other via email without divulging in the specifics of their lives, such as names, addresses, etc. (This being an era when Warner Bros. and AOL were just about to merge under the same umbrella, the product placement was apparently necessary, but is also probably the most blatant you’ll ever see.) All this is, of course, despite the fact that each of them already has their own beau, with Kathleen settled into a humdrum life with a Luddite named Frank who loves his typewriter as much as he loves to antagonize her about her laptop (Greg Kinnear), and Joe with an insufferably self-absorbed editor named Patricia (Parker Posey). Being a love story starring Meg Ryan and Tom Hanks, you know that the two are destined to be together, but with movies like these, it’s all about the journey that gets you to that happy ending. 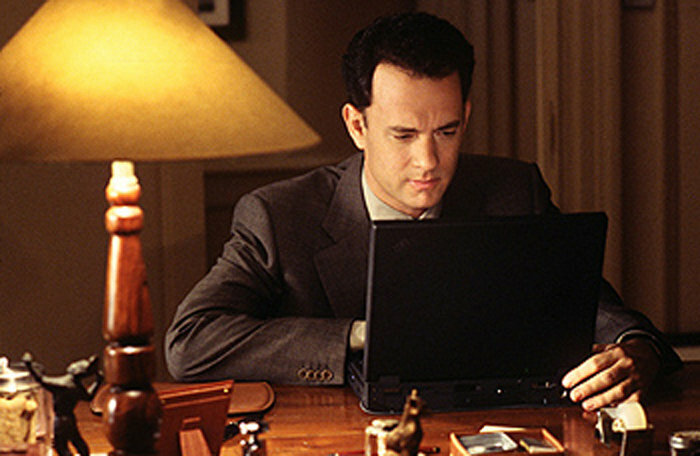 Luckily, You’ve Got Mail has plenty of engaging characters and snappy dialogue to help viewers get through the sometimes murky waters of the easily dreadful romantic comedy genre. 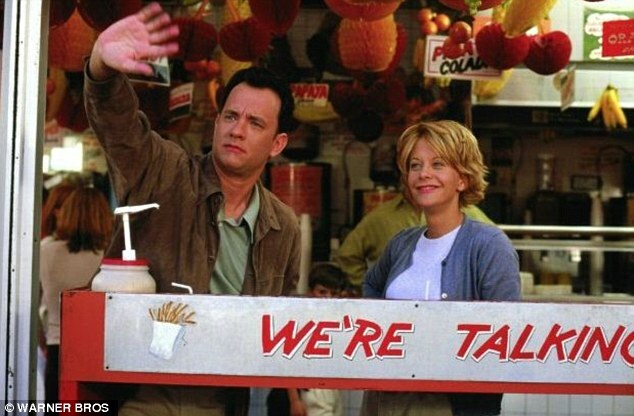 In what is still as of this writing their final screen pairing, Tom Hanks and Meg Ryan apparently grew to know how to play off each other very well, and their interactions as both rivals and distanced lovers-to-be are the true highlights of the film. Each of them is likeable despite having to play opposite sides of the same coin towards each other. It helps that they’re given plenty of great material to work with, too, such as (SPOILER ALERT) when they finally agree to meet, and Joe discovers who she is but decides to keep his online persona a secret. When she unknowingly follows his own advice and insults him for what he’s doing to her and store, the feelings of remorse for the genuine hurt she puts on his face rings true, as she realizes that there’s more to him than just a suit and money. Then there’s the time when her store finally goes under. Defeated, she wanders into the children’s section of Fox Books and breaks down and cries. Joe looks on from a distance as she tearfully recommends a favorite book to a mother, and Joe realizes just what it was that was lost when his store put hers out of business. It’s little moments like these that make You’ve Got Mailfeel more genuine and heartfelt than most romantic comedies, even Ephron’s own Sleepless in Seattle, despite the quirky characters and the heightened dialogue between the characters. Ephron’s updating of the story, previously filmed as the aforementioned The Shop Around the Corner as well as the Judy Garland film In the Good Old Summertime, is also rather ingenious, making the most of the product placement — which, in this day and age, feels almost quaint. Now that AOL is no longer an internet service provider, the film is actually getting better with age as we distance ourselves from that bygone era of dial-up noises and trial CDs waiting for us in the mail. We’re already seeing the concept of bookstores changing, with Borders having since disappeared and Barnes & Noble embracing the digital distribution model with the Nook and competing against Amazon, who has little physical presence in the brick-and-mortar world beyond gift cards. 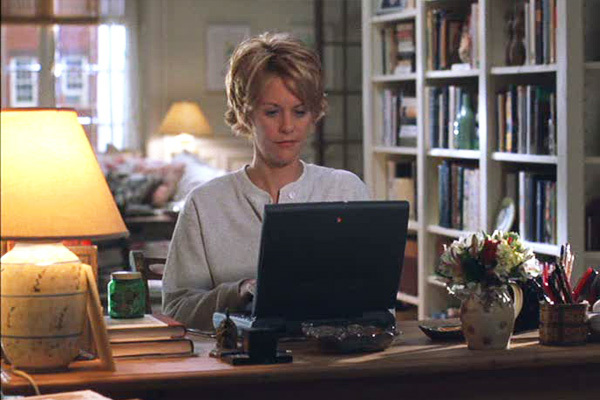 You’ve Got Mail was made in a time when internet usage was becoming a lot more mainstream, and, as a snapshot of technology history, it’s actually kind of neat to see how far we’ve come and how integral the internet was becoming and how much it would become to our lives within the 14 years since the film’s release. Not only that, it’s also fascinating to think of how familiar the film required its audiences to be regarding the internet, even if it was through proprietary software. Heck, there’s even a casual conversation about cybersex, and today, we’re still freaking out about “sexting,” even though the concept is nothing new. Compare that to earlier films like Hackers or The Net, which, despite starring Sandra Bullock, was not a romantic comedy. Both of those technological thrillers, released just three years prior to this film, relied upon audiences’ ignorance of the technology to make their otherwise dumb plots that much more interesting. I wonder if Nora Ephron realized just how much of a time capsule her silly little romcom would be? The simple fact is that, no matter the product placement, no matter the genre, no matter how many times the story has been adapted, You’ve Got Mail was and is one of the more enjoyable modern romantic comedies, a beautifully shot cozy movie with a story that has both male and female leads learning to go beyond their own personal needs and towards each other while surrounding them with likeable supporting characters played by likeable supporting actors (Jean Stapleton and Dave Chapelle most notable among them apart from Kinnear and Posey). And, while I can’t say that I personally liked most of Nora Ephron’s films, I can say that, without a doubt, I am genuinely going to miss being able to see her name in any new film. She may not be my favorite writer or director, but she was definitely capable of some thoughtful and highly entertaining work, and I’m sure we’re all going to miss her. Your style is unique in comparison to other folks I’ve read stuff from. I appreciate you for posting when you have the opportunity, Guess I will just book mark this web site.